This page is under reconstruction. The old contents below are being replaced by the artist's comments about how he is inspired by scences from movies like John Ford's 1939 Stagecoach to create his own versions of scenes. He sketches and paints scenes that tell part of the story from a movie. He prepares by visiting sites where movie scenes were filmed, such as Moument Valley. In today's world of DVDs, its possible for an older artist who can't get around as much as use to to freeze-frame a movie to study and sketch scenes frame-by-frame. That what this section of the artist's website will be about when its reconstructed. Monument Valley is land of the Navajo Nation. Beginning in the 1970s I visited there several times in search of places where John Ford set up cameras to shoot scenes for his westerns. At first I knew nothing about the landmarks and other features, so in order to find my way around I sat down beforehand with video tapes of Ford's movies. I would freeze-frame the tapes when I spotted something prominent. I sketched what I though would help me as I hiked to find the camera locations. The sketchbook page below is an example of what I did to prepare for a hike more. 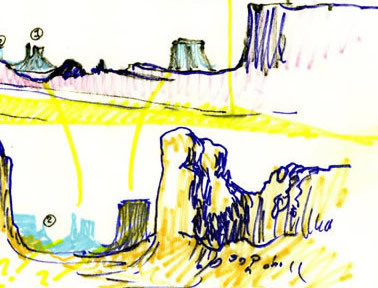 Numbers on the sketchbook page were used to identify landmarks before I knew their names. The sketches were done while looking at video tapes of movies. 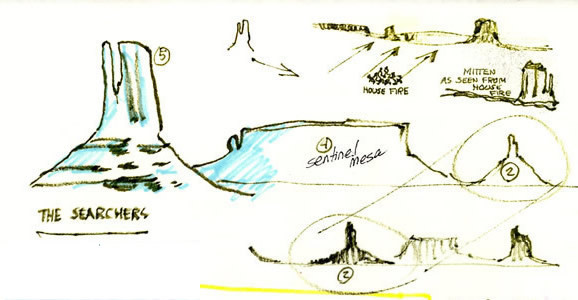 The inset below the sketch of Sentinel Mesa shows part of it from an oil portrait, Gene at John Ford Point. Gene's picture is linked to a view of the painting. I learned the names of the monuments and other features during my first visit in the 1970s. I did the pen and ink sketch shown below in 1990 at Goulding, Utah. For your information the monuments from left to right are: (1) Brigham's Tomb, (2) Natani Tso (Big Leader, also referred to often as King on his Throne), (3) The Castle, (4) Big Indian, and (4) part of Sentinel Mesa. 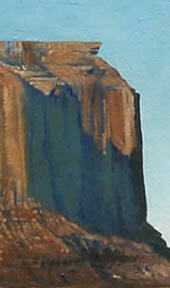 From the sketch view, The Castle Butte separates into Stagecoach, Rabbit and Bear. Most paintings that I do from sketches and photographs are not intended to show how things actually exist in Monument Valley. I use the same artistic license that John Ford did as a filmmaker. Monument Valley was a backdrop for his westerns. His films told stories. I like to create paintings and drawings that do the same. For example, my watercolor sketch Tyree's Ride an interpretation of a action sequence in Ford's She Wore a Yellow Ribbon. Sergeant Tyree is a character from a John Ford film played by Ben Johnson, a skilled horseman and the only experienced wrangler to ever win an Academy Award. During She Wore a Yellow Ribbon Tyree is sent out as a scout. At one point he is attacked by Comanche and makes a run for it. The freeze-framed sequence is an invitation to sketch and study horse and rider in action. The following links give you access to Monument Valley vistas and features. Also, in case you haven't noticed many of the links in the paragraphs above and for some of the images are searches of the Web using keywords I selected as being appropriate for this webpage. The search engine used is available at the top of this page and throughout Bob Glover.com. shows horse and rider sketched from photographs taken at Lost Valley Ranch, Colorado, the scene of this sketch (click on it for a view of the finished artwork).